RECON is a real-time data network, meaning the data are collected from the sensors in real-time, as opposed to other systems where data are stored in the sensor and must be manually downloaded at longer time intervals from weeks to months. 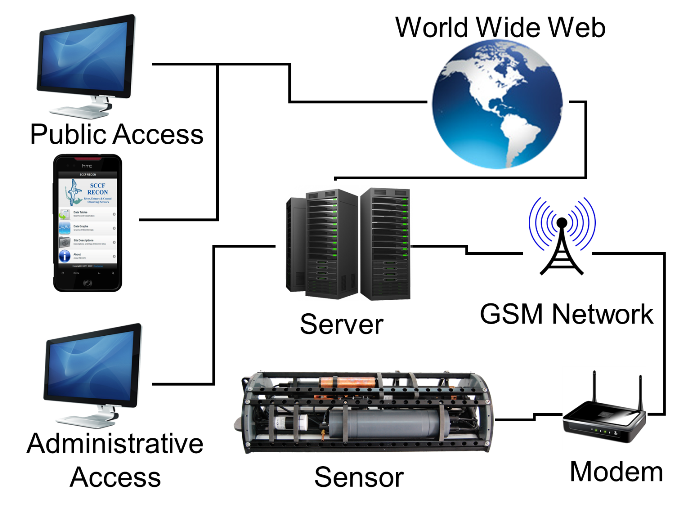 A real-time network has many advantages over other systems. Timely access to data is important to scientists. The ability to observe an event in near real-time allows us to view events as they are happening allowing us to determine if any actions (such as water sampling around a hotspot or area of concern) are necessary. Real-time data access also allows technicians to monitor the sensors for malfunctions or calibration problems, so that they can be quickly addressed so that long periods of data collection are not compromised. This allows a reduction in the amount of time the sensor is offline and maximizes the amount of usable data collected. Another advantage of the RECON system is its ability to remotely modify the sampling schedule as required. When the sensors are deployed several factors are used to determine how frequently samples are taken. We can modify the schedule remotely allowing us to tailor the sampling schedule for specific situations that might arise after the sensors have been deployed, such as increasing frequency in response to observed events such as major rain events and associated freshwater discharges. Another example is before and after a tropical storm or hurricane where we can increase the sampling frequency from normal hourly sampling. Each RECON sensor communicates with the server using the AT&T GSM cell phone network. The raw data is sent via a GSM modem to our RECON server. The raw data are then processed and decoded. The decoded data are imported and stored in a SQL database. This allows the data to be access and viewed on the RECON website in near real-time.